Happy Mardi Gras – no classes all week. High School (9 – 12) only. Regular school hours, dress attire. No school for PK – 8th grades. 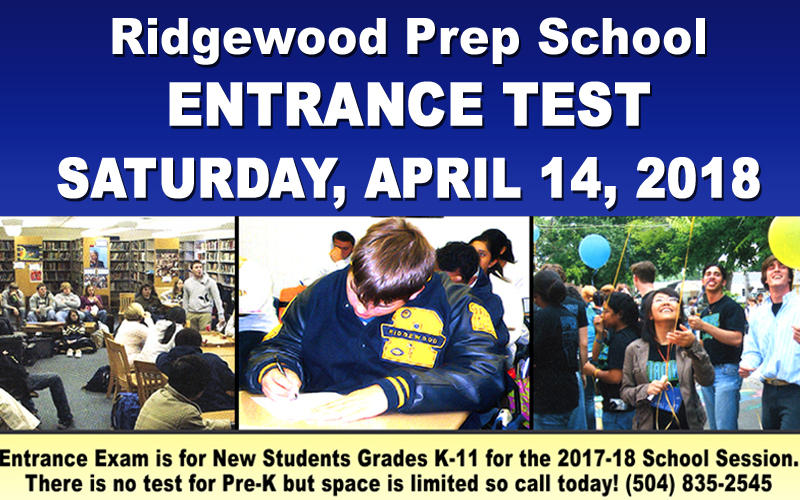 The test will be held on Saturday, April 06, 2019 at Ridgewood. Please plan to arrive no later than 8:15 a.m.. The test will take about 3 hours. The Ridgewood Prep School Application is available as a PDF file. The latest version of Adobe Acrobat Reader may be required to view the file. Get the latest version of Adobe Acrobat Reader (clicking this link will take you outside of the Ridgewood website).